Congressional staffers: What's it like to work for a member of Congress? What Is Daily Life Like for a Member of Congress or Congressional Staffer? 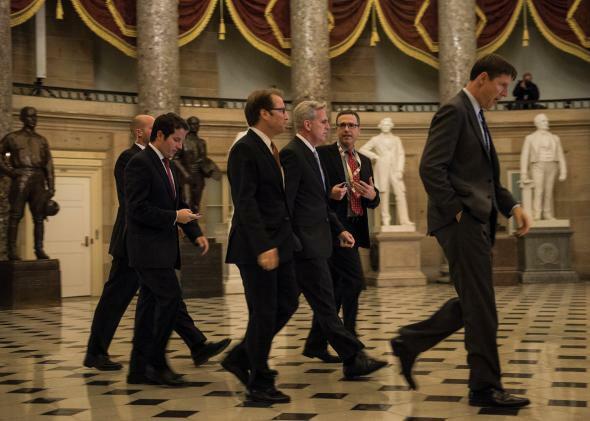 House Majority Whip Kevin McCarthy (R-Calif.) walks with staff through Statuary Hall to a vote on Capitol Hill on Oct. 16, 2013, in Washington. I was a staffer in the House of Representatives from 2005–2008, starting as an intern and ending as a legislative assistant before moving over to a federal agency as a liaison between the department and Congress until earlier this year. Before going into my experience, I think it’s important to outline what the average congressional office looks like. Constituent-specific work (e.g., identifying federal programs to assist constituents) is delegated out to a district office, the member’s back-home base. It will be led by a district director (sometimes the same as the chief of staff) and a handful of casework specialists. Sometimes, the communications director is also based in the district office. Policy-specific work (e.g., developing legislation) takes place in the Capitol offices. A legislative director (LD)—just below the chief of staff in the hierarchy—leads a small team of legislative assistants (LA) who have diverse policy portfolios. The LAs are responsible for keeping abreast of major issues and all legislation within their portfolios and providing advice to the LD, chief of staff, and member on votes and how these issues may impact the member’s constituents. Other positions in the Washington office include the communications director, a legislative correspondent (responsible for responding to constituent letters), the member’s scheduler, and some staff assistants and interns (unpaid or given a token stipend). That’s the general layout. Senate offices will have more staff than House offices and more caseworkers and offices in the state, given the responsibilities for a whole state are more intense than a district, but the division of labor remains about the same. You also have majority and minority staffers at the committee level and leadership-specific staff. I began my stint in Congress as an intern on a committee staff and eventually transitioned into a member’s office. My days as an intern began a bit earlier than the professional staffers’, starting around 7:30 a.m., since I was the one to open the office: collect and distribute the newspapers and mail waiting in the morning, open up the phones, check the office voice mail, and yes, get the coffee machine ready (even though most of the staffers above me would get their coffee from one of the cafeterias or from outside—or send me to go get it). I would spend the majority of my time greeting people as they came to the office, giving Capitol tours for constituents, and taking phone calls. This work was routine and repetitive—not a whole lot of satisfaction aside from knowing how privileged I was to be working in the halls of Congress (which I’ll admit, is a damned fine privilege). There might be some other work as assigned—gathering signatures for letters, running messages to members, etc.—but I didn’t get to do much substantive work since it wasn’t expected that I’d be picked up as permanent staff. I was usually sent home around 5 p.m.
At this juncture, my biggest fear was getting an angry constituent phone call that I couldn’t handle or doing something that I felt was innocuous but would end up bruising someone’s ego. Those might be apparently small things to be afraid of, but interns are utterly disposable; so if that angry constituent went on to complaint to the right (or wrong) people, or that bruised staffer on up, the job could be over very quickly. My aspiration, however, was to have a long career on Capitol Hill, so I was eager to learn the roles of the staffers above me. It also meant that I ensured that I did even the most routine tasks with the utmost professionalism in order to demonstrate the kind of value I could provide to the office and the member if hired on as a professional staffer. Eventually, I was picked up as a staff assistant, and my duties stayed pretty much the same as before, except now I was being paid and was invited more frequently to meetings with the legislative staff and constituent groups, lobbyists, and briefings with the member. Since I was permanent staff, the others in the office felt more comfortable showing me the ropes and trusting me with some basic research and legislative projects. Most of these projects involved diving into the histories of previous legislation—where they failed and succeeded, who were the players, etc.—and developing background briefs on pending issues. I also spent a lot of time working with the office’s legislative correspondent (the staffer whose primary function it is to sort and respond to the volumes of constituent mail the office receives in a day) to identify trends in constituents’ letters. My days bumped up to about 10 or 11 hours on average. At this point, my biggest fear, frankly, was being able to support myself, as the salary was not at all generous. My parents were happy to let me live with them for a while, but that was just good luck that I happened to be a Washington-area native. Most staffers I know and worked with live with many housemates, many of whom are also congressional staff, in order to be able to live and work in Washington on an entry-level staffer’s salary. (And it doesn’t get much better until you get to senior legislative assistant or legislative director.) This does add significantly to staffers’ stress, as they’re living in one of the most expensive cities in the U.S. I was not too worried about maintaining a work-life balance, though, as I was very much the Type-A kind of staffer who was happy to put work above all else. I was still committed to providing good constituent services, but my skin had thickened a bit, and I was less nervous about the bad phone calls that left people screaming. The problem, however, would be when a major politically charged news event hit the airwaves back home and we’d get flooded with angry phone calls. I’d leave work a lot of days being stressed by these negative encounters, and my worry was that I wouldn’t be able to soldier on. After a brief stint at a federal agency, I returned to Congress as a legislative assistant. My daily tasks were to support the member’s committee duties and constituent meetings, identifying possible legislative projects that would raise the member’s visibility, liaising with federal agencies to resolve constituent-generated issues that had highlighted policy deficiencies, and to take meetings with lobbyists on an array of issues under the policy portfolio I had developed as a staff assistant. There were also more trips back to the district to meet with constituent groups and conduct oversight of federal programs. I advised my member of Congress on votes, monitored floor activity for legislation under my portfolio, and assisted the communications director on developing statement connected with my issues. I won’t say that I was fearless at this point, but I had learned a lot about acting with conviction and being confident in defending my actions. That’s not to say that I wasn’t worried about doing my job well or ensuring that I was satisfactorily representing my member and the best interests of the constituents in our district, but I learned to recognize what was a crisis and what wasn’t—and respond accordingly. I would have loved to have stayed in Congress for a while longer, but so do most of the staffers who reach the legislative assistant level; and as such, there were not many openings available for me when I was told that my service in that office was at an end. I was eventually picked up by a federal agency as one of their congressional liaisons, so I was happy to at least remain keyed in to the Capitol culture. However, working with Congress from the outside—and as any semblance of comity there evaporated—I less and less romanticized about going back to working within the Capitol’s walls. Highly skilled and intelligent twenty- and thirtysomethings who want to demonstrate their value and make a worthy contribution to the direction of their country. They know that there are many, many people out there who would love to have their jobs, given the prestige of it, and work fervently to deliver results to their members to demonstrate their worth. The job is high-stress and high-volume and carries high expectations, even if 9 in 10 Americans think you and your members aren’t working at all (which doesn’t help morale much). They are grossly underpaid. Burn-out is extraordinarily common, depending on the member’s expectations. Some congressional offices I worked with had 50 to 60 percent annual turnover! A lot of staffers these days view working in Congress as a stepping stone to post-graduate education, typically law school, or as a networking opportunity to find something else. I don’t begrudge them for this—all staffers know that their careers are tied to the fortunes of the members they work for and they’d be fools not to keep something on the back burner—but it does mean fewer and fewer are really taking the time to learn and invest in their issues, since they’re putting a few years’ limit on their careers. I should also say that it’s easy for staffers to become arrogant in their positions. They know that they’ve been hired at the top of a very competitive and qualified applicant pool (openly advertised positions will receive hundreds to thousands of applications), and there’s a certain amount of pride that comes in the knowledge that elected officials are placing trust in you to represent them and the people who voted for them in however limited a capacity. That being said, the best staffers are the ones who approach their job with humility, knowing that they have a rare opportunity that carries a great burden of responsibility—and that can be ended by one bad election or a change in a member’s fortunes. I was and remain extraordinarily proud of the time I spent working in Congress, even if the institution itself isn’t exactly a beacon of pride these days. I had the opportunity to work with some extraordinarily talented people and gained valuable insights to the issues impacting the country. Certainly there’s more that I wish I could have done with my time, and wish I could have had more time to do it, but I’m not sad to have moved on. I just keep my fingers crossed that the staffers who fill the positions these days maintain or exceed that dedication. What happens if I simply don’t want Obamacare? Why has the U.S. government grown to the point that its own citizens are so distrustful of it? Why have Americans become more supportive of gay marriage?